We used the Swedish Bible Study Method to start our bible study plan. It is a method attributed to Ada Lum, an IFES staff worker and Bible reading enthusiast of many decades. The method is named for the group of Swedish students it was originally used with. 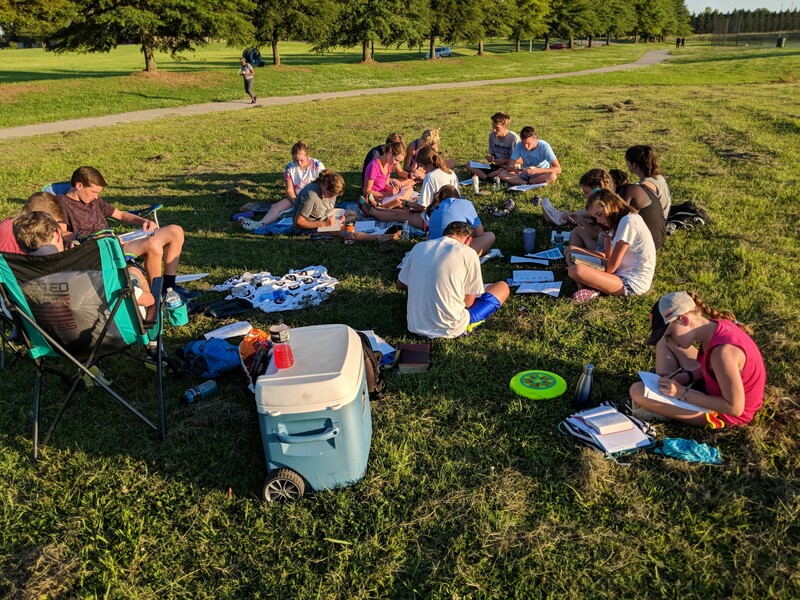 The goal was to find a way to lead students in learning how to study the bible by focusing on making good observations from God’s word to make sure they would interpret them correctly. It’s mean to get the student to focus on “what is God saying” or “what does the author mean” instead of just “what does the passage mean to me?” It also gets the student to end with application, looking at how this part of scripture is shaping their life TODAY. Another goal was to use a system that was easily replicable. It is designed around simplicity. They wanted students to quickly learn it so they could then lead other groups. That is our goal! Teaching students to be leaders to lead others in studying the Bible! Desiring God contributor Marshall Segol added a couple images to the system. So it’s as easy as the original three images (Light Bulb, Questions Mark, and Arrow) or you can continue to add more layers (Cross, Talk Bubble, Heart, etc) to the study. There’s room for lots of creativity and personal focus. A five minute study can easily give way to a half hour or hour long study! The great thing about this method is it is great for groups to study a passage together and discuss it together. It guides the discussion from what you are hearing from God in the passage instead of rabbit trails. It allows for each person to share with their partner or group what they wrote for each image. One of my main goals this summer was to get students studying passages together in pairs and groups. I think this method is great for that! Sometimes I like to print out the passage I’m studying so I can mark it up more. I’ll show more about that in the next post. But one way to do that is to use online Bible software webpages. I used BibleGateway.com to copy James 1:1-4. If you like to study online, you can utilize the Reformation Study Bible study notes on the passage to get some valuable commentary for your study. You can also select that you want to view cross-references for the passage. I like that Bible Gateway will place them at the bottom of your page so you can print it out easily on one page. I take it a step further though. I like to copy from Bible Gateway and paste into a Google Docs file. That way I can format it however I like. I prefer to double space the text so that I can mark it up, highlight certain parts, jot notes down on the sides, etc. I also like to delete the subheadings that the ESV likes to add for passages. So after I study the passage, I will give a title for the passages myself, something that helps me remember what I studied. *Resources gathered by Adam Coppock. Previous Book introduction to James!! !